I’ve been bursting at the seams for the last 2 months now and I can finally tell you why. When I first started writing here, sharing recipes, restaurant reviews and travel recommendations, I called my blog ‘eating/sf.’ I wrote sporadically and hardly imagined that more than 10 people would ever read the site. During this time, Matt and I were always cooking together while listening to music. When we started dating, I began discovering artists and bands I had never heard of before. He managed to pick just the right tunes for any occasion–a party, a romantic dinner, a family dinner, brunch. I was at the gym when I realized that something was missing from the blog–a huge part of my life: music. And so, Matt started contributing Musical Pairings to accompany my recipes. His keen awareness of the music scene, and thoughtful reviews started attracting a whole new group of folks to the blog.Soon after, eating/sf had a partner blog: Musical Pairings. It’s been a great, wonderful journey for us, but over the last year or so, we’ve been thinking that we’ve been outgrowing our old home (s)–especially after we had to unexpectedly transition Musical Pairings to WordPress, while eating/sf remained on Blogger. More and more, we felt that we needed a change. It felt somewhat appropriate, given our new beginnings: we got married, I changed my name, I started a new job, Matt started a new job. And so, we’re moving eating/sf and Musical Pairings to a new home. You can still expect the same quality content– recipes, Musical Pairings, Single Servings and reviews–but wearing a different outfit. After a lot of brainstorming and sleepless nights, we’re also very excited to share with you our name: Turntable Kitchen–the marriage of eating/sf and Musical Pairings. We’re still working on the site (but don’t worry, we’ll still be blogging here and at Musical Pairings leading up to the transition). 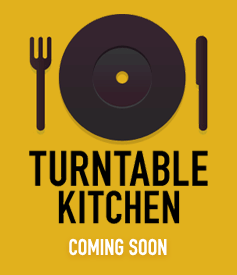 To make sure you stay up to date with the launch and any news, please visit www.turntablekitchen.com and enter your email address–we promise we won’t share it with anyone and will only use it as a way to get in touch once we launch the new site. Also, please start following our new Twitter account and Facebook page. We can’t wait to have you over to our new home! This entry was posted in food music blog, new beginnings, Turntable Kitchen. Bookmark the permalink. Congrats! I love the new name and branding. Great work!! Love the name! A very big congrats! Can't wait to see the new "outfit" soon. The funny thing is that I discovered this blog exactly thanks to Musical Pairings. But congrats and good luck! New beginnings are usually difficult but I am sure this will be just fine. It almost seems like a second wedding or something, doesn't it? Hi Elli- Glad you made the connection! Hopefully you'll like the new site! It def. feels like getting married for the 2nd time! I'm ready to wear that white wedding dress again!